I saw Barbara demonstrating this product at the Big Stamp Show at Alexandra Palace. I really liked the effects Barbara was achieving, so bought the kit. It will be along time before I get my prints looking anywhere nearly as good as Barbaras. 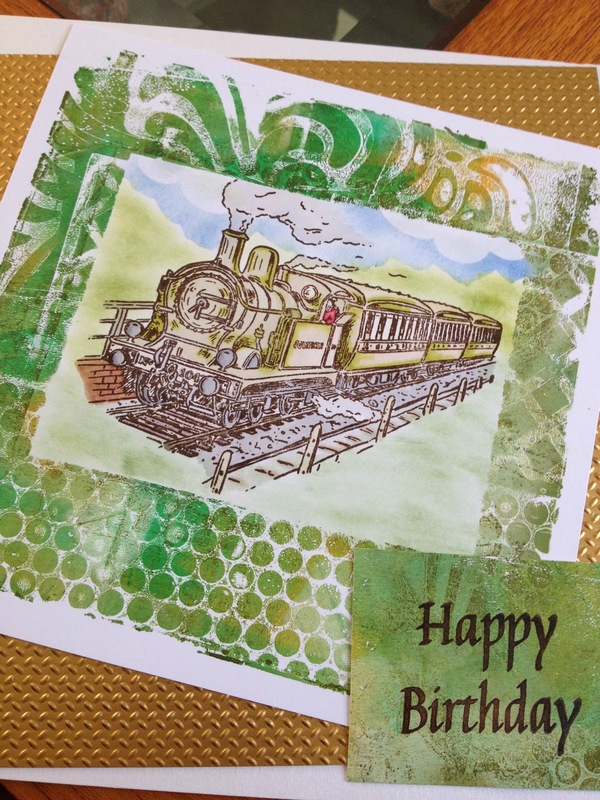 I decided to stamp a train in the centre, which I coloured with my promarkers but the sky, hills and the ground next to the rail, I coloured using Adirondack ink and makeup sponge. I then mounted the picture onto some gold embossed card which was then mounted onto an 8' x 8' card blank. The sentiment I stamped onto some more, Gelli Plate printed card, so that it matched. My friends know I do not like getting messy fingers but with this craft, although your fingers get dirty, they are not sticky because the Acrylic paint dries so fast.